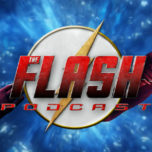 On this week’s The Flash Podcast, Andy, Amy and guest host Kat Calamia (from Legends of Tomorrow Podcast) get together to review 2.20 of The Flash titled “Rupture” where we meet the Earth-2 version of Dante Ramon a.k.a. Rupture who is coming to Earth-1 as he seeks justice for his brother’s death, Reverb. The gang also read listener feedback about “Rupture” before getting to the preview session for next week’s episode titled “The Runaway Dinosaur” which was directed by Kevin Smith! That and more on the latest episode of The Flash Podcast! Don’t forget, about the epic giveaway (which closes on May 8) that The Flash Podcast is doing with Odyssey Art Torch: click here to get to the tweet with all the information.